We’re constantly on the move trying new places, because if we didn’t, this site would get stale and you would be forced to read... actually let’s not think about that. But even though we have to cover a lot of ground, there are a few spots we return to often because they are Perfect For so many things. Jeffrey’s Grocery is the ideal example of that. This is one of the few restaurants in this city where we’re legitimate regulars. When Jeffrey’s Grocery first opened, it was a kitschy little cafe that also tried peddling groceries. Realizing that there was absolutely no need to sell milk and eggs to people who were just looking to go face deep into some raw bar, the restaurant went through a makeover for the best. They ditched the faux store-front, upgraded the chef, and made the most out of the space. Even though we’re here so often, we hadn’t updated our review since all these changes for the better were made. So here we are to tell you that this place is still awesome. 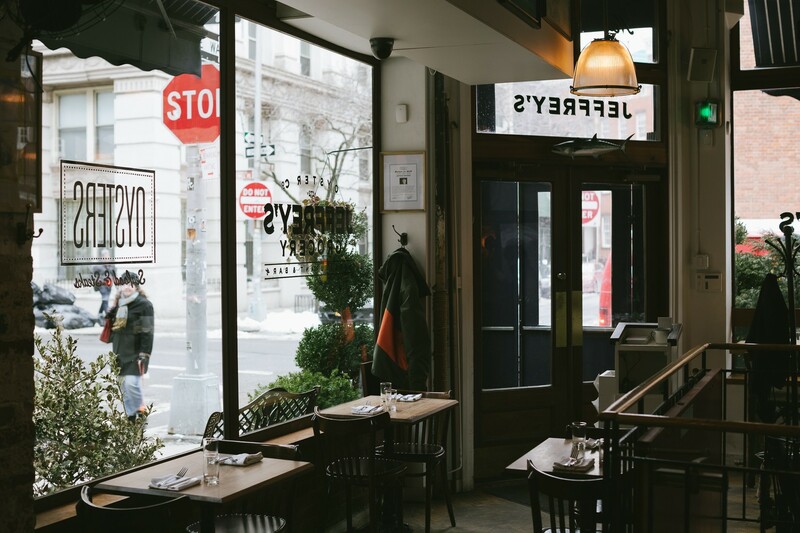 We love Jeffrey’s because the people are friendly, it’s easy to get in, and the food is great - especially the raw bar and the incredible clam chowder. It’s our go-to West Village weekday lunch move, and one of the better brunch situations in town because you generally won’t have to wait. It’s also just a fun place to hang out, and that’s important in our book. Oysters and king crab legs - that’s the one-two punch we go with at Jeffrey’s. That said, you really can’t go wrong with anything from the raw bar. Order freely. Poached eggs on a biscuit with crab meat, lobster hollandaise sauce, potatoes, and greens. This is our favorite thing from the brunch menu, and you’re gonna want it. Lemon ricotta flapjacks with blueberry compote. A no-brainer. This one is a big bagel party on a wooden board, with gravlax, smoked salmon, latkes, whitefish salad, scrambled eggs, etc. All the things you need to live well. Not too thick, not too thin, with full littleneck clams and just the right amount of cream. This is one of our favorite chowders in town. Bacon bits only make it better. A straightforward, very tasty salad of healthy greens, toasted pumpkin seeds, apple, and smoked cheddar in a cider vinaigrette. We eat this on every visit. This sandwich is legendary and has been on the menu since the beginning. Moist chunks of brisket with red beet-horseradish slaw and muenster cheese oozing out of warm, toasted sourdough. It’s more manicured than the typical massive New York deli-style brisket sandwiches, and we appreciate that. This salmon filet comes in a corn broth with shrimp and a ton of vegetables. Order it. The fish ’n chips here is excellent, and it comes with donut holes and a malt maple vinegar dipping sauce. So really, it’s fish ’n chips ’n donuts ’n maple.